FOR OFFICIAL RULES SCROLL TO BOTTOM OF PAGE. Click here for the Harley-Davidson giveaway terms and rules. These contest rules are specific to the above contest conducted by Jesse James Distilling 1480 Old 41 Highway Kennesaw GA 30152 (the “Brand”). A copy of these specific contest rules and directions on how to enter will be available on the contest page on the Brand website at www.jessejamesspirits.com. 1. No purchase necessary to enter or to win. a. On-site Method of Entry: From Monday, October 15 2018 through Friday December 14th 2018 contestants may enter by completing registration forms at participating Cosentino’s Stores, Price Choppers, Harry’s Liquors, onsite at Outlaw Harley Davidson of Blue Springs, Worth Harley Davidson of Kansas City and any other participating retailers. 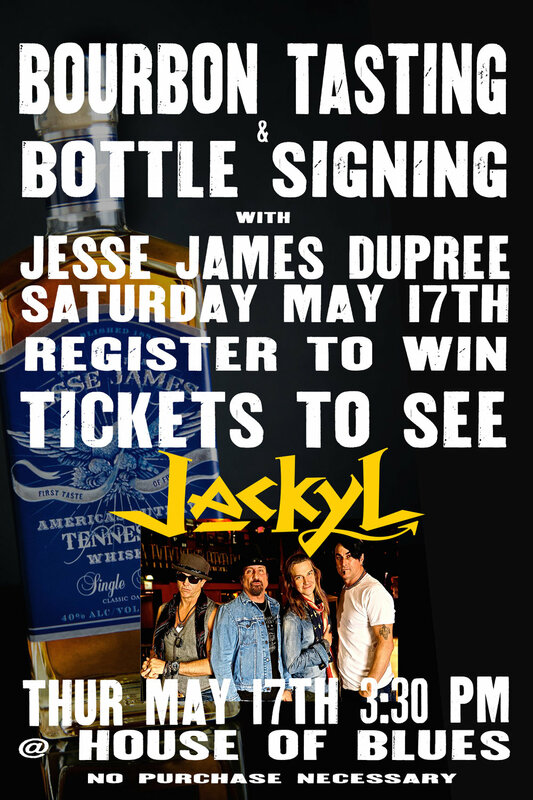 For a list of all participating locations entrants must refer to the contest page on the brand website at www.jessejamesspirits.com. Persons desiring to enter must complete an official entry blank and deposit it in the official entry box during the announced contest period only at the participating locations (no mechanical reproductions will be accepted), while supplies last only. Brand will randomly select up to Twelve (12) entries at the conclusion of the contest period as defined within this document. Those entrants will be qualified to participate in the Grand Prize Event, subject to verification of eligibility and compliance with these Contest rules and will be deemed On-Site Qualifiers. Those On-Site Qualifiers will be provided with tickets and access to participate in the Grand Prize Event. b. 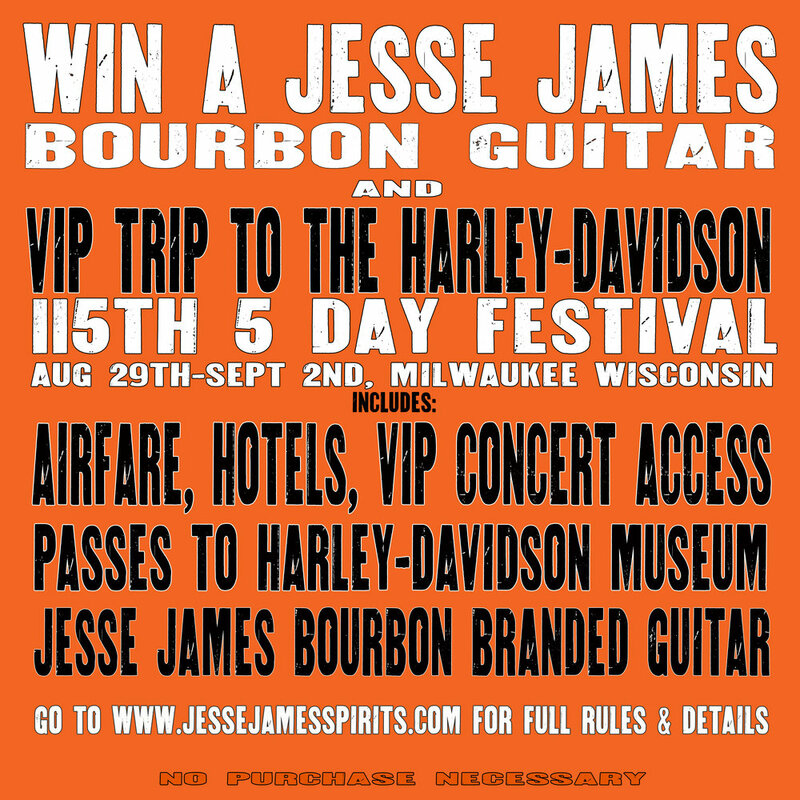 BONUS ENTRY Automatic Qualifier: Beginning November 29th 1 (one) “bonus” entry into the contest may be attained by following the appropriate directions on Jesse James Spirits Instagram and Facebook pages. 1 (one) qualifier will be selected from all of the qualified social media entrants that have posted a picture of themselves holding a Jesse James Spirits product. That image must be taken in a participating store location during the dates of the contest and include the registration box in the image. The poster must tag @jessejamesspirits in the post. The poster must use the #drinkupstream in the post. Only one image per poster will be accepted, any additional posts from the same individual or account will not be considered. 3. All Qualifiers are collectively hereafter referred to as “Qualifier(s)”. No person may be a Qualifier in this contest more than once, regardless of the mode of entry (only the first chronological qualification will count, any subsequent qualifications will be deemed disqualified). Qualifiers cannot transfer or assign their qualifying spots to other persons. With respect to Qualifiers, Brand will only be required to leave one (1) message at the number provided through or in the potential Qualifier’s entry. If no answer or answering machine is reached or the number is wrong or disconnected, Brand will not be obligated to attempt any further contact. However, Brand reserves the right, in its sole discretion, to attempt to contact any potential Qualifiers more than once and shall not be required to attempt to contact all potential Qualifiers an equal number of times. 4. All Qualifiers, subject to verification of eligibility and compliance with these Contest rules, will be invited to participate in The Grand Prize Harley Giveaway Event (the “Grand Prize Event”). The Grand Prize Event will take place on Friday, December 21st, 2018at Arvest Bank Theater at The Midland 1228 Main Street Kansas City, Missouri 64105. 5. IN ORDER TO PARTICIPATE IN THE GRAND PRIZE GIVEAWAY AND BE ELIGIBLE TO WIN THE GRAND PRIZE, QUALIFIERS MUST ATTENDTHE GRAND PRIZE EVENT IN PERSON AND CHECK-IN WITH BRAND STAFF NO LATER THAN 7:00 PM (CT) FRIDAY DECEMBER 21ST2018. Qualifiers will be notified of all check in requirements and as per the rules of this contest will be provided tickets and appropriate access to the event. Qualifiers must present a valid government-issued picture ID and will be required to sign a Release “as-is” at check-in. If a Qualifier has not checked-in and produced and executed all required documentation at The Check in location by 7:00 p.m. (CT), such Qualifier will be disqualified and their opportunity to participate in any portion of the Grand Prize Event shall be forfeited. Qualifier spots are not transferable or assignable. Properly checked-in Qualifiers will be deemed “Finalists” in this contest. 6. At or after approximately 8:00pm (CT), The 12 Finalists names will be entered into the contest drawing and 1 name will be selected live on stage at the show. That name will be declared the winner of the contest and subject to verification of eligibility and compliance with these Contest rules. The Contest will be immediately over. 7. ANY FINALIST WHO HAS DEPARTED THE GRAND PRIZE EVENT WILL FORFEIT THEIR RIGHT TO PARTICIPATE IN THE DRAWING. All Finalists then present will be eligible to participate in the drawing. 8. Participants hereby agree to strictly follow all instructions and directions given by Brand personnel at the Grand Prize Event and understand that any intentional failure to comply with these Contest rules or procedures or instructions given by Brand staff will result in immediate disqualification. In no event will any “deal-making” between participants be permitted. Brand reserves the right to disqualify any person that it suspects has participated in or offered or accepted any type of “deal-making” with respect to this Contest. b. Various other prizes as designated by the Brand at the time of the event. 10. State sales tax for the Harley-Davidson prize portion must be paid by the Grand Prize Winner in accordance with state law, based on the estimated retail value of the Harley-Davidson motorcycle. SALES TAX, TITLE AND REGISTRATION, AND ANY OTHER CHARGES MUST BE PAID BY THE WINNER TO THE APPROPRIATE AUTO DEALER(S) PRIOR TO BEING ENTITLED TO RECEIVE THE HARLEY IN THIS CONTEST. Failure to do so within 30 days of the date that the Winner is advised that the Harley-Davidson is ready for pick-up may result in forfeiture of this portion of the Grand Prize, in Brand’s sole and un-appealable decision. In both Kansas and Missouri, the actual sales tax rate is dependent on the home address of the taxpayer. Contest participants are advised to contact their State Department of Revenue for actual sales tax rates and information. If the Grand Prize Winner resides in Kansas, the required sales tax of this portion of the Grand Prize may be as much as $2,000.00. If the Grand Prize Winner resides in Missouri, the required sales tax may be as much as $1,200.00. These tax values are estimates only. Brand does not guarantee that tax information contained in these Contest rules will accurately reflect the actual tax due from Winner upon receipt of Grand Prize. Notwithstanding the foregoing,Contest participants are advised to contact their State Department of Revenue for actual sales tax rates and information. 11. Grand Prize Winner shall be solely responsible for obtaining and payment of any federal or state required registration, inspection, insurance coverage, and taxes for the Grand Prize. Additional information regarding the warranty, pick-up/delivery, and additional information will be mailed to the Grand Prize Winner within three weeks of winning. Grand Prize Winner will be required to complete all relevant transfer documents for the Grand Prize at Outlaw Harley-Davidson in Blue Springs, Missouri during regular business hours. Neither Brand nor Outlaw Harley-Davidson has made or will be responsible in any manner for any warranties, representations, or guarantees, express or implied, in fact or law, relating to such vehicle, including without limitation, its quality, mechanical condition, merchantability, or fitness for a particular purpose, with the exception of any standard manufacturer’s warranty that may apply to the vehicle. 12. Odds of winning depend on total number of eligible entries received. Odds of a Qualifier winning the Grand Prize depend on the total number of eligible Qualifiers identified through the rules of this program. 14. In order to be eligible as a Qualifier, all entrants must be twenty-one (21) years of age at the time of entry into the contest which begins October 1st. 15. In the event that the Grand Prize Event needs to be rescheduled for any reason, such postponement will be announced on the Brand’s website. It is the sole responsibility of each Qualifier to check the website. Notwithstanding the foregoing, Brand may (but is not obligated to) send a written, email or telephonic notice to Qualifiers regarding any necessary rescheduling of the Grand Prize Event with the rescheduled date/time but in no event will Brand or Sponsors have any liability or responsibility for any Qualifier’s failure to receive the message for any reason or any Qualifier’s inability to attend the event on the rescheduled date (and no alternative opportunities will be offered).